What would you say of someone who announced on their blog that they were retiring from chess and then went on to win a major championship? Well! Samuel Shankland happens to be one such person. IM Shankland was in a three-way tie with defending champion GM Ray Robson and NM Parker Zhao after nine rounds. An Armageddon playoff followed for the title. There were two playoff games. Since Robson had a better tie-break score, he could wait to play the winner of the Shankland-Zhao match. Shankland and Zhao bid secretly how much time (up to 45 minutes) they would need for the game. Zhao bid lower so he had less time and Black. But he only had to draw to win the match. Shankland won. In the final game, Shankland had Black and both he and Robson had same time. Shankland had to only draw to win the title. 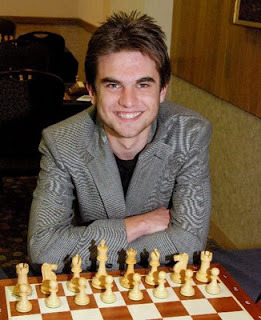 Shankland played the solid Caro-Kann Defense and Robson responded with the Fantasy variation. But Robson blundered under time pressure and lost. Here are both the playoff games. You can run them in our pgnplayer or watch in flash below. You can check the official website for more information. 3D Chess on iPhone: Checked it yet? Chess Champion Hunt: Computer versus Computer!